Since the arrival of Little Lady day to day life has been decidedly hectic. Balancing the needs and wants of a toddler with the needs of a newborn has been a challenge that no amount of preparation could have prepared me for, however we have started to settle into a semblance of a routine as a family of four. One of the greatest challenges has been finding fun, engaging and independent activities to occupy Buddy while I am feeding his sister, who seems to be the worlds best cluster feeder. We prefer to avoid television and technology because Buddy plays better and acts nicer when we are all switched off from technology, so instead we have been having fun coming up with busy boxes and simple play ideas for him to enjoy. Todays activity was a really simple, minimal prep, colour sorting activity. 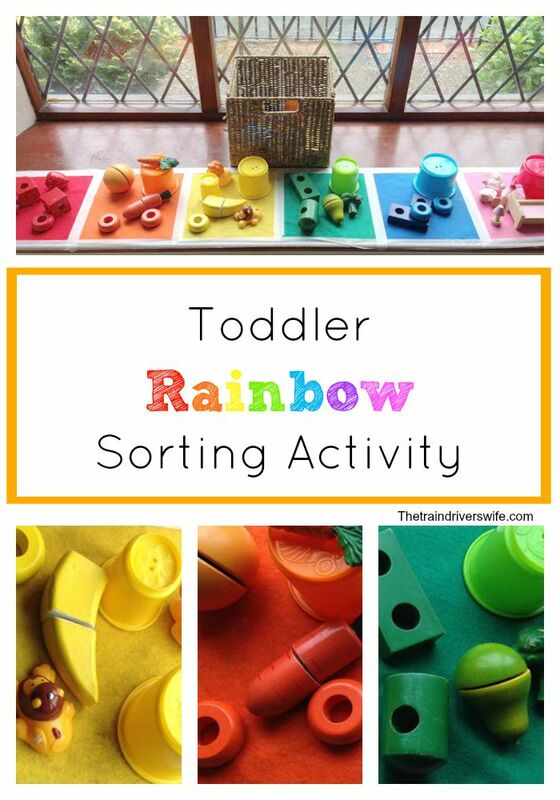 I used coloured felt squares to mark out the Rainbow colours and then collected a variety of different coloured toys and objects for Buddy to sort. The nice thing about this activity was that I could sit near Buddy while he picked through the objects and we could talk about the colours while he sorted them. Although he wanted my input, verbal input was sufficient, which is great at preventing tantrums in our house. This list is by no means exhaustive. You can use anything that is easy to access. I gathered our objects while tidying up from our morning playtime. I also managed to (miraculously) convince Buddy not to pull up the coloured squares, so they are ready to play with again during Little Lady’s breakfast tomorrow morning. How do you keep your toddler occupied? Do you have any amazing ideas that we can try? You know I love to hear from you so go ahead, leave a comment. If you enjoyed this Simple Play activity why not also check out our 10 Simple and Fun One Year Old Activities or these Ten No Mess Sensory Activities from Adventures of Adam.